Denver Millennium Bridge at the end of the 16th Street Mall. 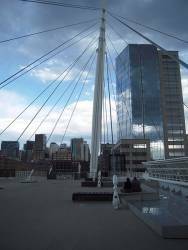 The biennial Joint Conference of the IEEE International Frequency Control Symposium (IFCS) and European Frequency Time Forum (EFTF) will be held at The Colorado Convention Center in Denver, Colorado, USA on April 12 -16, 2015. The deadline for abstracts is January 9, 2015. Online submission is open. For more information about exhibiting, contact Sue Kingston at the email below. For registration information, please visit the website listed below.